The name of Somalia’s Islamist insurgent group al-Shabab – it means “The Lads” – may conjure images of a lovable band of rogues. But the radical militia is a fiercely secretive and ruthless organisation with alleged links to al-Qaeda. Anyone who ignores these warnings is likely to receive a visit from the gunmen. 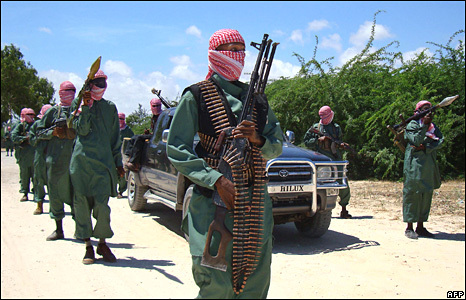 Al-Shabab emerged from the remnants of the Union of Islamic Courts, routed by the Ethiopian forces that invaded Somalia in 2006. In areas under its control businesses must remain shut at prayer times. On public transport, men have to sit at the front, and women at the back. All forms of public entertainment are forbidden, including watching films. The leaders of al-Shabab want nothing to do with the clan system that is blamed for so much of Somalia’s divisions and they have ambitions to spread their rule beyond Somalia’s borders. The spokesman for al-Shabab, Sheikh Mukhtar Robow, has said publicly there are foreign fighters in his group. As well as alleged links to al-Qaeda it is said to have Arabs, Asians, other Africans and – America’s FBI believes – Westerners among its ranks. These foreigners are said to be involved in training al-Shabab recruits in various aspects of guerrilla warfare, including suicide bombings and booby traps. In January there was a failed suicide attack against AU peacekeeping positions in Mogadishu. The governor of the Banaadir Region around Mogadishu, Mahamed Osman Ali, told the BBC Somali Section soon after the attack that the assailant was a foreigner, possibly of Arab extraction. In February, two suicide bombers from al-Shabab attacked an African Union military base in Mogadishu, killing at least 11 soldiers and injuring another 15. It was the fourth suicide attack against African peacekeepers and the deadliest. An al-Shabab spokesman told the BBC one of their bombers, Ahmed Sheikh-Doon Siidow, blew himself up in the compound of Burundian peacekeepers. 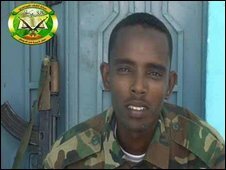 Another bomber, Mursal Abdinur Mohamed Ali, drove a car laden with explosives into the same base – a building which was formerly home to the Somali National University. Mursal Abdinur was a young man in his early twenties raised in one of the oldest districts of Mogadishu, Hamar Jabjabo, and a student at one of the many madrassas in that district. Saed, who asked the BBC not to reveal his real name for security reasons, knew him. 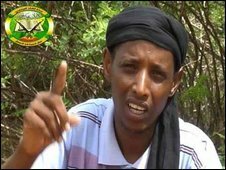 He said: “Al-Shabab recruited [Mursal Abdinur] in 2006 when they established the Salahu Din training camp in Mogadishu. “He was a normal young man who lived with his parents. He liked football and was sociable but when he joined al-Shabab, he became very quiet, and completely changed. Saed said he had never thought Mursal Abdinur would kill himself and was shocked when he heard the news. The Somali transitional federal government implemented Sharia law in the country in March in an effort to drain support for the radical Islamist guerrillas. But a senior police officer in Mogadishu – who also asked the BBC to withhold his name – said the government’s move would not stop the killing because al-Shabab had a “hidden agenda… to make the world unsafe”. The police officer said al-Shabab was led by foreigners, while some younger members of the organisation were Somalis who had spent time abroad. They had often been dropouts or addicts and were the most vulnerable to be used as suicide bombers, he added. The BBC tried to speak to members who have deserted al-Shabab, but they declined, fearing repercussions. But through speaking to former al-Shabab members, the Somali police say those recruited for suicide bombings are given drugs and are barely aware of the consequences of their actions. Police also said that some al-Shabab members know little about religion and are simply brainwashed to carry out jihadist activities. The Ethiopian troop pullout in January has left an over-stretched and understaffed African Union peacekeeping force in the capital that is now struggling to find a peace to keep. As The Lads consolidate their territorial gains and menace Mogadishu, Somalia’s text message insurgents have so far proved very hard to cut off. Previous The Soon To Emerge Crisis In Ethiopia: A Bush Legacy?